Quincy air compressor QGS is a belt driven rotary screw air compressor that is a reliable source of compressed air for a variety of industrial applications. This quite air compressor offers models such as QGS-25 (25 hp air compressor) all the way up to QGS-60 (60 hp air compressor) for your compressed air needs. 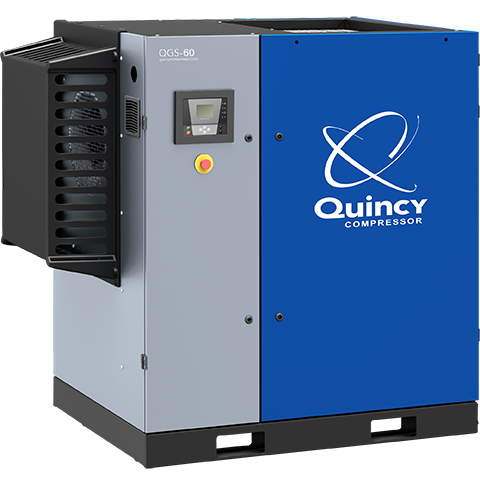 The Quincy QGS rotary screw air compressor line includes 5-100 hp air compressor models that include a long-life V-belt drive, high efficiency intake filter and a robust TEFC motor. The standard quiet enclosure is designed to reduce vibration and noise levels making this a quiet air compressor. The eight-thousand-hour premium synthetic fuel features a low oil carryover. An integrated dryer and tank mount option is also available. If you choose a 5-15 hp rotary screw air compressor, you get access to a number of advanced optional features. 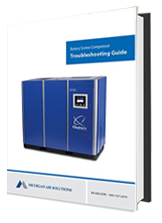 These include a high-temperature refrigerated dryer, and a 100 and 150 psi conversion kit (recommended for 10-15 hp rotary screw air compressor models only). Options that are available with 20-30 hp models include a 120-gallon receiver tank with manual drain and 575/3/60 Hz & 380-415/3/50 Hz electrics. The QGS is equipped with a 40-100 hp gearbox drive-train that is designed for peak efficiency, while also minimizing unproductive downtime due to worn, broken or damaged belts. You’ll also get the advantage of less frequent belt replacement. The energy efficient airend can be a big money-saver in terms of your energy costs.